Juliana is a Senior Accredited Counsellor/Psychotherapist currently studying at doctoral level. She has experience of working with diverse issues at a number of different agencies and settings. keep my training up to date. The majority of my counselling experience has been at GP practices based in Plymouth and south-west Devon, as well as in Private Practice. I am currently one of the lecturers on the degree course in Counselling and Psychotherapy at Marjon University. 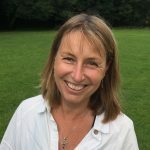 I have been a founder director of Counsellors South West, set up by a small and dedicated group of existing primary care counsellors which has grown to cover the Teignbridge, South Hams, Tavistock and West Devon areas. I see myself primarily working from a Person-Centred Approach. I have training and experience within primary care working as a Cognitive and Behavioural Counsellor, which I integrate into my work. I use ideas, techniques and skills from many approaches if it feels to be the right thing at the right time with the right person. I am developing a fierce interest in philosophy after having worked alongside many people asking themselves “What is life and how shall I live mine ?”. I started my counselling training in 1998. Before that I was a primary school teacher working in Plymouth and Bere Alson. While I loved many aspects of my teaching career, I also felt that it was not something I wanted to do forever. I started the counselling training while I was teaching and knew instantly that I had found my vocation. Before teaching I lived in France from 1988 to 1997. During this time I held various positions as a bilingual secretary for festivals and conferences that take place in Cannes; I taught English as a foreign language ; I also cooked on classic sailing yachts, research vessels and cargo ships around Europe, as well as across the Atlantic to the Caribbean. Most of my time these days is spent with my passions – my children, Yoga, close friends, walking the dogs, reading and counselling.